There’s no official artist credit given for the incredible killer lizard painting on the cover of True Men Stories, Vol. 1, No. 3, February 1957. But if you’re a fan of men’s adventure magazines, you may know who painted it. 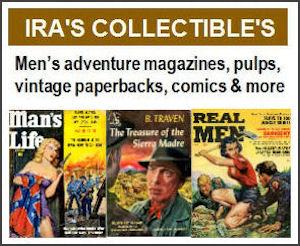 True Men Stories was published from 1956 to 1973. It’s a classic and relatively classy example of the genre (by men’s pulp mag standards). Most issues feature excellent cover paintings and interior art by some of the best pulp artists, like Hulsey, Clarence Doore, Norm Eastman and others, though unfortunately the artists are often uncredited. 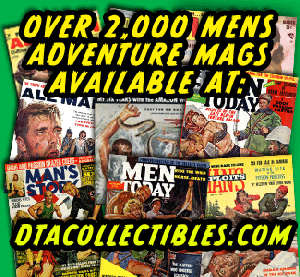 True Men Stories also has a nice spicy, “manly” mix of pulp fiction and non-fiction stories that are great fun to read. In fact, the headlines and concepts of some of the stories are entertaining in themselves. For example, the February 1957 issue had several classic “killer creature” stories. The one Hulsey did the cover art for is titled “LIZARDS FROM HELL.” In Hulsey’s painting, they look like small iguanas, which are generally vegetarians. On the inside, the story features a stock photo of a different lizard that looks like one of the slow-moving desert species that would probably be hard-pressed to attack anyone. And, of special interest, there’s a noir-style story by the legendary author Harlan Ellison. Titled “DEATH CLIMB”, it features cool, noir pulp illustrations (uncredited). UPDATE – Harlan sold us reprint rights to his “Death Climb” story!!! 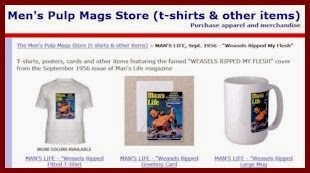 It’s one of the classic men’s adventure magazine stories we included in our WEASELS RIPPED MY FLESH! anthology. 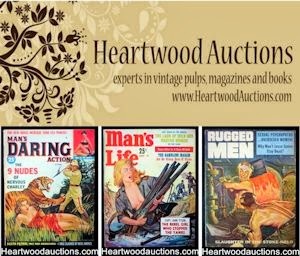 In future posts, I’ll talk more about some of the writers who provided fiction and non-fiction stories for men’s adventure magazines. 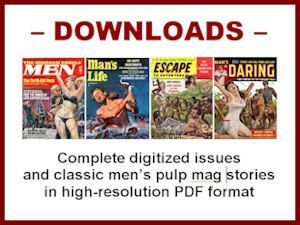 One of those writers that I had the honor to communicate with recently is the great Robert F. Dorr, who authored literally hundreds of stories for men’s magazines. Dorr has also written many books – including the recent and highly recommended Hell Hawks! : The Untold Story of the American Fliers Who Savaged Hitler's Wehrmacht.